ABC has decided to cancel Don’t Trust the B in Apartment 23 after one and a half seasons on the air. The network has pulled the low-rated sitcom off the schedule and it’s unclear when or if viewers will be able to see the eight unaired installments. Don’t Trust the B in Apartment 23 debuted early last year and revolves around sweet girl (Dreama Walker) who moves to New York for her dream job and, after it evaporates, ends up moving in with a con-artist party-girl (Krysten Ritter). 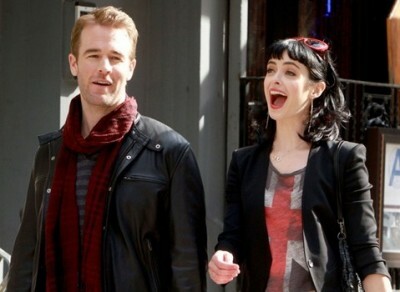 The cast also includes Liza Lapira, Michael Blaiklock, Eric Andre, Ray Ford, and James Van Der Beek, playing a fictional version of himself. With mediocre ratings, the sitcom was on the bubble for renewal last May with an average of a 2.3 rating in the 18-49 demographic and 5.71 million total viewers. ABC opted to take a chance and order season two but the ratings have been significantly lower this time around, thanks in part to the sitcom being moved to Tuesday nights. The network tried to give struggling Don’t Trust the B and Happy Endings some additional exposure by running episodes in 666 Park Avenue’s old Sunday night timeslot but that experiment proved to be a dismal ratings disappointment. The 11 episodes that have aired this season have averaged a 1.1 demo rating and 2.85 million viewers. ABC has now pulled Don’t Trust the B from the schedule and some of the stars of the show realize that this marks the end of the road. What do you think? Are you sorry to hear that there won’t be a third season of Don’t Trust the B? Do you feel like it’s a better show than what the ratings indicate? Is it better than other sitcoms on the ABC schedule? Want to know the status of other ABC shows? Unreal This is why I watch Netflix. Wow ABC you dropped the ball. You all are out of touch. Great show. Super bummed out about this. Why is it always the best shows that get cancelled, not fair, I hope we can at least see the remaining episodes. So extremely sad to see this show was cancelled. Me and my bff love watching it during Margarita night. Only 5 episodes left to see on Netflix… I already feel the depression setting in. LOVED the show…why do all the good shows get sacked..right after I learn about them! The Beek Made this show. It wouldn’t have been nearly as funny without him. I love it when stars embrace their celebrity status and are able to laugh at themselves. Love the show – so sad to hear that it has been cancelled. Brilliant cast and script – no other show currently on TV is near it. If not picked up again, I hope all episodes will be released on DVD.